I appreciate what James David is writing on design over at The Groundswell Blog. Today he looks at the post The Revolution Will Not Be Designed by Alix Rule in his post Designing the Revolution. In particular, design metaphors obscure the ideological—and political—decisions involved in tackling societal issues. Depending on your perspective, “drunk driving” can be a symptom of some broader systemic failure (from un-walkable suburbs to deficient public education), a lapse of individual responsibility, or a right to be defended. The solution to the problem is inseparable from its conception. Conceiving of global ills as design challenges may sometimes be in order, but only when a consensus exists on goals, budgets and relevant values. Such is rarely the case. Continue reading Human-Centered Design Metaphors?. Bluetooth as an Aid to Walking? Bleill's set of prosthetics have Bluetooth receivers strapped to the ankle area. The Bluetooth device on each leg tells the other leg what it's doing, how it's moving, whether walking, standing or climbing steps, for example. "They mimic each other, so for stride length, for amount of force coming up, going uphill, downhill and such, they can vary speed and then to stop them again," Bleill told CNN from Walter Reed Army Medical Center, where he's undergoing rehab. "I will put resistance with my own thigh muscles to slow them down, so I can stop walking, which is always nice." Hmmm, what do you get if you hit "redial" while you are asleep -- sleepwalking? Continue reading Bluetooth as an Aid to Walking?. El Alcalde de Málaga, Francisco de la Torre, ha presentado hoy el Plan estratégico de Accesibilidad Universal de la ciudad de Málaga 2007-2011. Este documento es una propuesta integral que ofrece una solución a los problemas que las personas con discapacidad puedan tener en Málaga. En él se articulan medidas concretas que resuelven todas y cada una de las facetas de la vida privada y social, no solamente para las personas con discapacidad, sino para el resto de ciudadanos malague?os que puntualmente pueden tener reducida su movilidad. Continue reading Malaga - Plan de Accesibilidad (Spanish). Around the World on a Skateboard! Connolly took 32,000 photos and has created an online exhibit, called The Rolling Exhibition at http://therollingexhibition.com/. It's a wonderful exhibit, which allows the viewer to see the world from a unique perspective. Many of the images are visually stunning because of the upward angle that captures aspects of the scene that one usually doesn't experience. I know its theme is the staring but the composition and subjects on the street make many of the images pure artistry. If this is any indication of his documentary abilities, I will be there to buy tickets to his first film. Continue reading Around the World on a Skateboard!. Ii was just on Sandy Dhuyvetter's Travel Talk Radio. It's always great to talk to Sandy. This is to inform you that last date for submission of films and documentaries is FEBRUARY 9, 2008. If still you are interested in sending the entries for the above WECARE FILMFEST, please send them on or before the LAST DATE. We have received a large number of films and documentaries from various countries including India on various issues of disabilities. ALSO FORWARD THIS INVITATION TO ALL CONCERNED YOU KNOW INTERNATIONALLY. Steak & Shake: Where ADA Compliance has Been Taken Off the Menu! Americans with disabilities spend more than $13.6 billion annually on travel. The Open Doors Organization calculated that in 2003, persons with disabilities or reduced mobility spent 35 billion dollars in restaurants. According to the same study, more than 75% of these people eat out at restaurants at least once a week. But Karen at A Deaf Mom Shares Her World tells a story that gives these mind-numbing numbers some texture and reality. So I told him about the Americans with Disabilities Act and I explained that taking orders through the window is an accommodation that I need because I can't use the speaker to place an order. He kept insisting that orders need to be taken at the speaker. "If you had just let me know at the speaker that you needed accommodations then I could take your order through the window." "But I'm DEAF! I can't hear on the speaker! When I drove up, the first thing that I told you was that I couldn't order back there because I can't hear through the speaker." ASTA, [the American Society of Travel Agents] filed comments today with the Department of Transportation (DOT) on the issue of Oversales and Denied Boarding Compensation. ASTA provided the DOT with numerous recommendations for updating the more than 20-year old rules that currently govern the process of Denied Boarding Compensation practices. Continue reading ASTA Files Comments with the Department of Transportation on Oversales and Denied Boarding Compensation. The European Union brings together a diversity of languages, cultures, and political jurisdictions. It probably comes as no surprise then to learn that the European Network for Accessible Tourism (ENAT) discovered 40 different sets of accessibility standards among its members. Continue reading ENAT Project on Accessibility Standardization. Continue reading Análise da Consulta Nacional: Especifica? ?es técnicas para fabrica? ?o de veículos para transporte coletivo de passaeiros (Portuguese). Waypoint books custom charters to explore waterways around the world — including the Pacific Northwest, Alaska, Mexico, the Caribbean, the Mediterranean and the canals of Europe. An independent charter broker representing thousands of luxury vessels worldwide, Waypoint has begun brokering handicapped-accessible charters in part due to company owner Sherri Backstrom’s own physical challenges. A lifelong sailor and yachting enthusiast who has been diagnosed with a neurological disease, Backstrom started her company with the mission of helping people of all ability levels travel the world’s waterways. To learn more about Waypoint Charter’s broker services for yacht and sailboat vacations, go to www.waypointcharter.com or call the Waypoint office at 656-5934. Continue reading Ahoy! 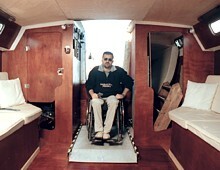 Accessible Yachts from Waypoint Charter. John Macdonald describes himself as engaging in "the great Canadian indoor pastime of dreaming about warmer locations " in his piece, Daydreams of Warmer Places. A nova lei, com data de 23 de janeiro, foi publicada no Diário Oficial de hoje, quinta-feira, 24. Depois da transforma? ?o visual da nossa cidade, incentivado pelo Programa Cidade Limpa, agora s?o as cal?adas que v?o fazer a diferen?a. Além da estética, o mais importante é a acessibilidade. Se já é difícil circular na maioria dos passeios públicos de S?o Paulo, imagine para quem tem uma deficiência ou mobilidade reduzida - como idosos, m?es com carrinhos de bebê, obesos ou pessoas com uma perna quebrada, por exemplo? Continue reading Decreto do Passeio Livre ( 45.904/05) - (Portuguese). Kudos to Travel Age West Magazine! Nearly 4,000 cruisers hit the decks and staterooms of Royal Caribbean’s Freedom of the Seas this fall for an eight-day cruise from Miami with ports of call including the Cayman Islands and Jamaica. But there was something different about this cruise: The entire ship was chartered for individuals with hearing impairments for a jaunt dubbed “The Deaf Freedom Cruise 2007,” led by Virginia-based specialty travel agency Passages Deaf Travel. Continue reading Kudos to Travel Age West Magazine!. What happened to airline loyalty programs? * All the big lines other than Northwest now cancel your accumulated miles if you don't show account activity within the most recent 18 to 24 months. And, this year, many of them revised the fine print to permit unilateral changes in program rules with only a 30-day notice. * Continental and Delta tightened up on award rules, hiking the mileage requirements for some awards (Continental) or no longer allowing travelers to book any available seat for double to triple the usual miles (Delta). * All the lines have been making it increasingly difficult to find frequent flyer seats at the base award levels, especially on the more popular vacation routes. And, in my experience, upgrades and premium-class award seats are almost impossible to score without paying double to triple the base number of miles. * Several lines have hiked the various fees they charge when you try to book a "free" seat, including charges for bookings made fewer than 20 days in advance, charges for refunding miles for unused tickets, and charges for phone bookings. Seniors are apt to be especially vulnerable to frequent flyer devaluations. Many earn miles more slowly than the average frequent flyers. Many prefer to use miles for long trips to popular destinations. Many prefer—even need—the extra space and comfort of business- or first-class seats. And many have to save miles over a period of up to three years to accumulate enough for those purposes. Travel at Insight Radio: "Europe's First Radio Station for Blind and Partially Sighted Listeners"
Presenter Simon Pauley chatted with Hannah Williams about some of the holidays the charity organise for blind and partially sighted people. What is it Like to Fly the "No Frills" Skybus Airlines? Well, I don't know yet. (I haven't had much cause to want to go to Columbus, Ohio recently). Their web site sounds like they know how to follow the Air Carriers Act however. One wonders if their system of allow passengers to explain their travel needs only through an online interface is sufficient. I have found no other airline that allows appropriate specificity of information that can be left in one's customer profile or included when purchasing a ticket. 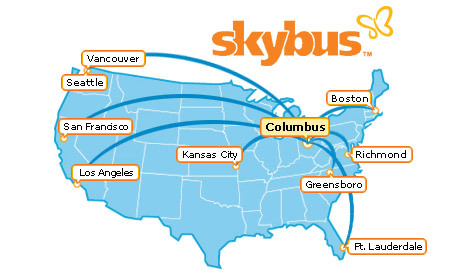 Continue reading What is it Like to Fly the "No Frills" Skybus Airlines?. Fernando Carvalho, presidente da autarquia, salientou o investimento efectuado no sector do turismo nos últimos anos, em especial na oferta de alojamento, referindo que ?agora queremos agregar o turismo acessível para todos?. ?Pretendemos deixar de ter barreiras para aqueles com algumas dificuldades?, acrescentou o autarca socialista, que anunciou para este ano alguns investimentos nesta área na apresenta? ?o do projecto. Continue reading Lous? Vai Ser o Primeiro Destino "Acessível a Todos" (Portuguese). I have been calling it "the distinction between and sterile and style." Rita St. Clair of the Chicago Daily Herald sets it out at, "No need to choose between attractiveness and accessibility" in this brief nod to Universal Design. Engineer, NITK's Technical Symposium will be held Feb 14 - 17, 2008. The subject of their "Last Word" discussion will be social responsibility. You will be ale to follow events through their blog. Will Universal Design be one of the approaches advocated? The term “Social Responsibility” in the topic needs to be put in perspective first. It refers to the social relevance of various innovations and contributions of engineers to the nation. The topic, as professionals, are we giving back to the country, whatever we take from her? Are we doing enough to help the nation? This has been thrashed enough in many debates. Perhaps we should move beyond that to ask: If I’m an engineer, do I use entrepreneurial approaches to development / social innovation for my profit or to fulfill my social obligations? From a different viewpoint, even if we actually want to be “socially responsible” and contribute to the nation, how could we go about doing that? More significantly, is ensuring the social relevance of our actions a moral duty or just a little thing we do not need to bother about? Assuming that the need of social relevance is established, what should be driving our actions: Economic Imperative or Moral Imperative? Continue reading Engineer 2008 and "Last Word" Discussion on Social Responsibility. The following recommendations are the result of the CAT 2007 Conference held at UNESCAP in Bangkok, November 22-24, 2007. Continue reading Bangkok Recommendations on Accessible Tourism in Asia and the Pacific. The process of drafting and adopting the Convention on the Rights of Persons with Disabilities by the member countries of the United Nations has now brought the issues of discrimination and exclusion faced by persons with disabilities to centre stage. The universal definition and understanding of Disability has rightfully moved from being a merely 'Medical' to a 'Human Rights' framework and heralded a paradigm shift from 'charity' to 'rights based' approach. Continue reading A Paradigm Shift from "Charity" to "Rights & Dignity" - An Essay by C. Mahesh. Samartha Travels in Mumbai has Rentals: Do India in a Lift Van! Prasad Phanasgaonkar of Mumbai runs a car rental agency. He also has Muscular Dystrophy. They built this lift-equipped van. Brazil Takes Leadership -- but Does it Hear "Nothing About Us Without Us?" Through this visit [of Tourisme et Handicap] it was possible to verify that the situation is better than we imagined. Christ the Redeemer (Corcovado) and Sugar Loaf, for example, need only small adaptations to be totally accessible. The agency left with is the European Union norms that are going to guide the work, said the sub secretary who pointed to the Hotel Sofitel in Copacabana as ideal in terms of accessibility for people with physical disabilities. In all, the trend is positive. After consultation with the Brazilian disability community results could be excellent. What: Please join us for a press conference announcing the release of Easy Access Chicago, the first-ever comprehensive visitor guide for travelers with disabilities. The Easy Access Chicago guide provides detailed information about the city’s accessible offerings allowing visitors with disabilities to make informed choices about their travel experience in the Chicago Area. A copy of Easy Access Chicago is available by calling the Illinois Bureau of Tourism at 1-800-2CONNECT or by visiting www.enjoyillinois.com or easyaccesschicago.org. When: Thursday, January 17, 2007, 10:00 a.m.
RSVP: If you have any questions regarding the Easy Access Chicago event or to RSVP, please contact Eric Lipp at ericlipp@opendoorsnfp.org. We look forward to seeing you at this important event. Jet Airways enters the spotlight as another company with a Stone Age customer service policy in an era of jet-set technology. Once again the morally bankrupt policy of discrimination causes severe damage to an airline's public image (and thus profitability). Note that the airline's apology specifies that "allowing" Ms. Jindal to fly is an aberration from their standard of discrimination but only "in her case." Let's examine the case: She cannot walk. She cannot stand. The airline does not provide even the basic cabin equipment such as an aisle chair. Her husband had to drag her to her seat (which, presumably, did not have a movable armrest.) Her net worth is $1 billion dollars. She may be fit enough to run a $1 billion business empire, but Jet Airways found the wheel chair ridden Jindal family scion Sminu so unsafe to fly that it asked her recently to either sign an indemnity bond or deplane. The incident — which again highlights airlines’ apathetic attitude towards physically-challenged passengers — happened when 34-year-old Sminu Jindal, who heads Jindal Saw, was travelling from Delhi to Bangkok on Christmas with her husband Indresh Batra on Jet’s business class. Continue reading Indian Airline Continues to Embarrass the Nation. Plane travel can be frustrating for anyone, with the inevitable delays and cramped conditions. For anyone with a disability, you can double that frustration and times it by 10. The full extent of disabled passengers' frustration with airline services was revealed in a report last month released by the Public Interest Advocacy Centre and NSW Disability Discrimination Legal Centre. Of 110 disabled people and carers surveyed about domestic air travel, only 14 found their experience positive. One man had his wheelchair badly damaged by baggage handlers, another wheelchair-bound passenger was forced to pay for a carer and then questioned extensively by staff about toilet needs - even though it was only a one-hour flight. Another passenger was refused boarding because his wheelchair was too large. No wonder that one woman, whose husband is a quadriplegic, simply described flying as an "ordeal". Continue reading The Ordeal of Air Travel. A prefeitura do Rio pretende contratar empresa especializada em forma? ?o profissional para treinar 200 pessoas com deficiência física para atuar na área de turismo. O edital da licita? ?o foi publicado no Diário Oficial nesta segunda-feira (14), segundo a Secretaria especial de Turismo. O subsecretário de Turismo, Paulo Barros, explicou que, em muitas oportunidades, uma empresa pretende contratar um profissional com deficiência, mas n?o encontra candidatos com o treinamento necessário. Ele acredita que a demanda é grande nas empresas turísticas e em hotéis da cidade, seja para melhor atender aos clientes deficientes ou mesmo para cumprir a legisla? ?o que determina a obrigatoriedade de 2 a 5% de funcionários com deficiência em firmas com mais de 100 empregados. "Essa medida ajuda a criar uma cultura favorável ao atendimento às pessoas com deficiência. Um profissional com forma? ?o adequada que seja deficiente atende melhor ao cliente que está na mesma situa??o. No 1o semestre, a inten? ?o é que o curso treine 200 pessoas. Mas o número pode aumentar no 2o semestre de 2008", declarou Barros. Continue reading Deficientes ser?o treinados para turismo: Treinamento para capacitar 200 deficientes (Portuguese). Kango.com, VibeAgent.com - It Looks Like We are Making Progress! Tim from Business of Online Travel talks about how Kango is the natural evolution of meta-search to solve the problem of too much information – Kayak aggregates price, Travelzoo aggregates deal and Kango aggregates content, reviews and travel information,”(Kango) takes all of the unstructured data out there from web based sources (TripAdvisor, Travelpost, Expedia, Orbitz, Travelocity, etc) and combines it into a structured data result…into a contextual summary”. Travel&Tourism Suppliers who have an interest in reaching the growing Minority travel market can do so by displaying their products at the Travel Professionals of Color 6th annual trade show and conference being held in New Orleans, La., April 28, 2008. Continue reading Travel Professionals of Color Conference. Is Delhi ready to accommodate disabled visitors during the Commonwealth Games? Continue reading Is Delhi ready to accommodate disabled visitors during the Commonwealth Games?. Human Rights Commissioner and Commissioner responsible for Disability Discrimination, Graeme Innes AM, today welcomed the release of the draft report on the review of the Disability Standards for Accessible Public Transport. The report was released by the Minister for Infrastructure, Transport, Regional Development and Local Government, Anthony Albanese and the Attorney-General, Robert McClelland along with an invitation for interested stakeholders to provide comments by the end of March. “This draft report provides us with valuable information on the effect of the Transport Standard since it was introduced in 2002 and the degree to which the aim of significantly improving access to public transport has been realised,” said Commissioner Innes. Continue reading HREOC welcomes report on disability standards for transport. A draft report into disability access on public transport has found that standards might have actually declined in some areas. The report is part of the five-year review of the Federal Government's Disability Standards for Accessible Public Transport, which came into force in 2002. The draft makes nine recommendations, including that the Human Rights and Equal Opportunity Commission (HREOC) should have the power to refer breaches of the standards directly to the Federal Court. The commissioner, Graeme Innes, says there are still significant challenges for disabled passengers, particularly in air travel. "Some of that relates to customer service issues, and ... aircraft infrastructure issues where companies just aren't ordering or configuring aircraft which would be suitable for people with disabilities," he said. Continue reading Australia's Federal Government's Disability Standards for Accessible Public Transport. Canada's major air carriers have been ordered to offer disabled travellers the same fares as everyone else. Under a Canadian Transportation Agency ruling, travellers who need additional seating because of their disabilities will no longer have to pay more than a single fare for domestic flights. Continue reading Airlines Ordered to Drop Extra Fares for Disabled. by air in Canada without having to pay a second fare. Continue reading One Person, One Fare: Canadians in the Air. Continue reading Remarks on Inclusion in Tourism from the January 7, 2008 ADA Business Connection Leadership Meeting. It is a pleasure to see USA Today giving prominence to questions about Inclusive Tourism. Once again Linda Burbank tackles a timely question with a well-researched answer. The problem remains the failure of the industry to adopt Universal Design. On cruise ships the limits of space mean that we will need to think very creatively and not just "throw square footage" at the problem. 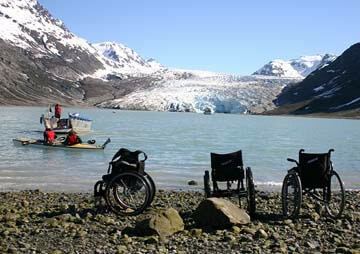 Continue reading Accessible Cruise Question. Knowledge itself often does better in a collaborative environment than in a competitive one. Debates with a winner and loser are usually not very productive or conducive to genuine learning. Collaborative environments that embrace many points of view, especially where those views are in perpetual conversation with one another, overall are richer in what they know and what they understand. Within them, knowledge can be what it is and not what the dominant side would like it to be. Knowledge finds its integrity in the perpetual conversation where it is in play. Continue reading The Adversity of Knowledge. ORLANDO, Fla., Jan. 7 /PRNewswire/ -- The Society for Accessible Travel & Hospitality (SATH) (www.sath.org) -- whose mission is to raise awareness of the needs of all travelers with disabilities and expand travel opportunities in the United States and worldwide -- has presented its Access to Freedom award to Roy. E. Flora, Chief Operating Officer of Atlanta, GA- based US Franchise Systems, Inc. (USFS) (www.usfsi.com), parent company of the franchisor of the Microtel Inns & Suites and Hawthorn Suites hotel brands. The honor was presented late yesterday at the 12th annual SATH World Congress in Orlando, FL. Continue reading Roy Flora Receives Access to Freedom Award for Inclusive Travel Excellence. "A journey of a thousand miles begins with a single step" - or ends with one. It seems merely simple wisdom but turning it into a business model that is transforming the hotel industry required uncommon insight. ángel Luis Tadeo is a man who knows that a single step--or a single curb, raised threshold, or a doorway that is too narrow for a wheelchair--can prevent a journey. He had the wisdom, and business sense, to understand that this means that somebody (500 million somebodies worldwide by his calculation) is not receiving the product they need. Continue reading Hotel Dunas Canteras: Inclusive Destination Development Nests in the Canary Islands. When my Polish ancestors came to the United States from the old country they landed in Pilsen - a district of Chicago. As Director of University Ministry at Benedictine University I worked with some remarkable students to build a service learning relationship with that district, birthplace of Benedictine University's St. Procopius Monastery and now a Mexican neighborhood. As would be expected in the Czech Republic, Tatra cars dominate the tram fleet, which is painted in a pleasant yellow-based scheme. The ubiquitous T3 car forms the backbone of the service, operated in both one- and two-car formations. Very unusually - and maybe uniquely - some T3 cars have been 'diced and spliced' to produce an articulated set with a low-floor section. The method would appear to be to remove the rear portion from one car and the front portion from another, then sandwich the two remaining sections around a newly-constructed low-floor piece. This highly ingenious practice not only provides disabled access but would also appear to benefit capacity, too - an important consideration as Plzen's trams appear to be well-used. Continue reading Pilzen (Plzeň) in the Czech Republic. As trilhas do Parque Estadual do Jaraguá, na zona oeste de S?o Paulo, acabaram por passar por reformas. Nesta quinta-feira, uma delas come?ou a receber a visita de deficientes físicos. Um trajeto de 400 metros, batizado de Trilha do Silêncio, foi especialmente adaptado a cadeirantes, deficientes visuais, pessoas com pouca mobilidade e idosos. Exemplo que diversos outros parques deveriam seguir. Continue reading Parque para todos: Parque Estadual do Jaraguá (Portuguese). To read this site in Uruguay, El Cisne, you will need to know Spanish but, even for those who do not, it is encuoraging to see the site promoting inclusion in tourism with these articles in their Turismo section. Continue reading El Cisne Magazine in Uruguay Begins to Take up Inclusive Tourism. If there were ever a glorious tourist destination that seemed out of reach to someone in a wheelchair, it must be Venice — where going a couple of blocks often means crossing steep, stepped bridges. Pat Broderick had always dreamed of going to Venice, Italy, but was daunted by accessibility. Surprisingly, it proved not to be that big of a challenge. Here she is at San Marco's square. Just getting there can be a challenge that requires negotiating docks, stairs and, of course, boats. Even for Pat Broderick, who has wheeled through Egypt, South America and Nepal, the watery island city of Venice had long remained an unfulfilled life goal. But the intrepid traveler refused to give up on her dream. So the two of us took off on a quest to conquer Venice and its aura of inaccessibility. As any idea or invention becomes disseminated through a society it changes. Similarly as ideas move from their cultural contexts and take root in another changes occur. Here Shoji Nakanishi of Disabled People International (DPI) Japan re-clarifies the founding concepts and principles of the Independent Living Movement as it undergoes the two-fold process of mainstreaming in its host context and internationalization to new cultural contexts. The question arises, "Is the new faithful to the intentions of the original?" Blog [with]tv will be hosting the next Disability Blog Carnival on January 10, 2008. The theme that will be presented is "Disability in the Media: Tell us of your experiences and/or your impressions." Read more at the [with]tv blog post "Who Should Be Representing Us?" As Inclusive Tourism and Inclusive Destination Development emerge further into mainstream thinking it is important the its implementation be truly "universal." With the age inversion of populations in an increasing number of countries, the prevalence of older travelers, and the frequency of blindness as a consequence of aging the observations and guidance of those who have had long experience with blindness is a social asset of increasing value. Below is the document, Creating A Barrier Free Society, from the World Blind Union on the proposer implementation of the seven principles of Universal Design. Continue reading Universal Design & Blindness: Creating A Barrier Free Society. May more of us live in such a place!
? Prayaville is a barrier-free city with an affirmative policy of inclusion of people with disabilities (PwD) that is evident in its infrastructure as well as its business and civic cultures.
? Prayaville is a city with a community of citizens, as well as long- and short-term guests with disabilities, who actively participate in civic life through government, business, education, media, and the arts.
? Prayaville is a destination of choice for people with disabilities because it has applied Inclusive Destination Development principles of Universal Design in developing its tourist assets.
? Prayaville has differentiated itself from other tourist destinations while positioning itself within the mainstream tourist route of Thailand and of Southeast Asia. Continue reading New Year's Resolutions -- 2008.